Since the late 1990s, Alan Cohen has photographed “improbable borders” around the world. 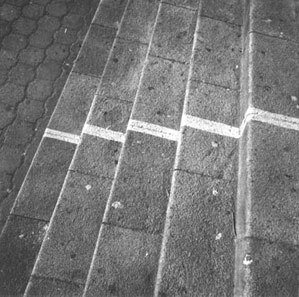 His abstract black-and-white photographs are visual evidence of generally invisible geological or geopolitical demarcations. Examples are borders between states or territories rich in historical context, or navigational tools such as lines of longitude and latitude. All of these marks are usually found only on maps, which are themselves a flat field of abstract information about the world. This exhibition focuses on Cohen’s documentation of the equator on land and sea. Although the site is 24,901.46 miles long, it lacks true physical dimension. Cohen, however, has located two sites in Ecuador where the equator becomes both physical and visual. Just north of Ecuador’s capital city, Quito, is a small tourist site that rests directly on the equator. Designed to represent a typical Ecuadorian village, with a main square, church, cockfight ring, homes, and stores, “Mitad del Mundo” features a painted line that goes up and down stairs, through a church, and through a monument before disappearing into the Andes. 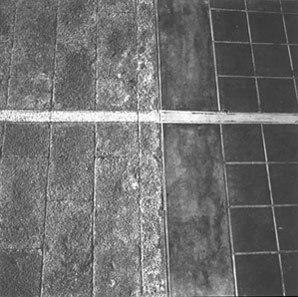 Cohen documented his walk straddling this equator with one foot in each hemisphere. The equator becomes visible again in the Galapagos Islands, a territory of Ecuador 600 miles west of the mainland. The Galapagos are located at the confluences of five ocean currents. Here Cohen documented physical lines on the surface of the water where two of these currents collide at the equator. Alan Cohen received his BS in Nuclear Engineering from North Carolina State University (1966) and his MS in Photography from the Illinois Institute of Technology, Institute of Design (1972). Cohen is currently Adjunct Associate Professor at the School Art Institute of Chicago and visiting faculty at DePaul University and Columbia College Chicago.